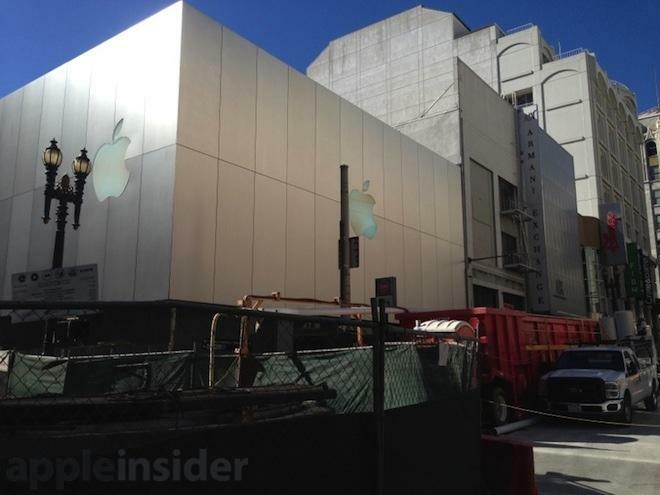 According to a report by the San Francisco Business Times, the current One Stockton Apple Store building will change hands for nearly $50 million, or an incredible $3,000 per square foot. The price sets a new real estate price record even for San Francisco's upscale Union Square shopping district, where properties have been trading for closer to still rather rarified $2,000 per square foot. There's scant room in the neighborhood for retailers wanting to locate next to other high end brands, making Apple's own sourcing of the prime spot being vacated by Levi's even more fortuitous. Apple has nearly outgrown the One Stockton spot (show above, behind the supposedly "minimal invasive" Central Subway construction). The store originally featured a theater that has since been removed to make space for more "One on One" training session tables. The location sports a skylight perched above an all-glass staircase, but those showy steps also consume much of the building's functional central space. It also lacks windows outside of the ground floor frontage. Apple plans to demolish the existing, triangular wedge building formerly used by Levis (portrayed below) and build a new store in its place, using a design reflecting the company's more recent retail palaces with wide open interiors fronted by walls of glass. 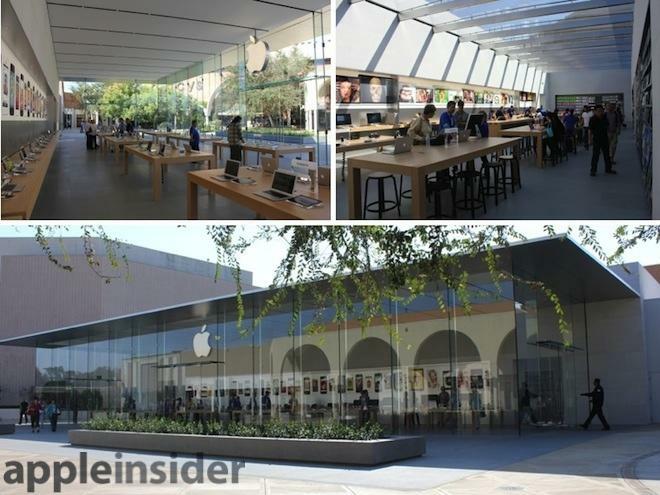 At the iPhone 5s unveiling earlier this month, Apple's chief executive Tim Cook called particular attention to the company's recently upgraded Stanford store, which similarly employs walls of glass that make its roof appear to hover (below). 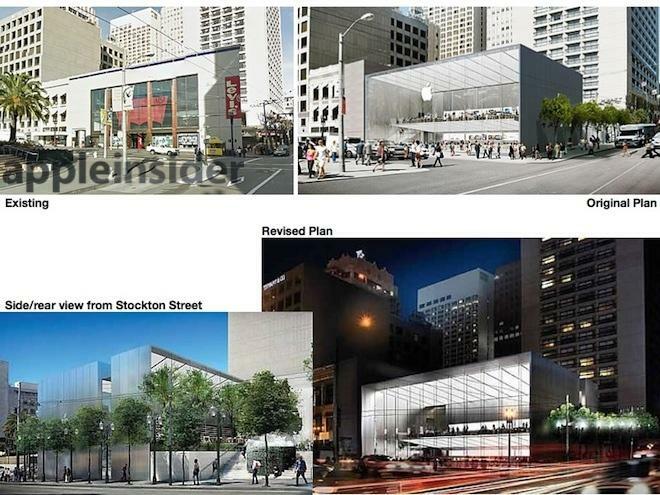 Apple has adjusted its Union Square building plans in response to San Francisco's committee-designed permitting process, which loves to micromanage the minor details of arbitrary projects that pique its interest, while rubber-stamping horrible building plans that don't. So far, the City's input has resulted in arbitrary changes to the planned building's front that mandate its glass front must be inset by a few feet, and stipulated a side window to break up the oppressive 20 foot high wall of steel Apple had intended to erect along Stockton. The revised plan also portrays an existing folk art fountain behind the store, which became the subject of much hand-wringing and consumed more attention and concern than the City's boondoggle Central Subway currently being tunneled underneath the spot. Construction of the multibillion subway stint has shut down Stockton Street in front of Apple's existing store for most of the past year. It someday plans to shuttle short trains from Caltrain to a new station directly on Union Square, and then a few blocks north to Chinatown, expanding a feeble transit system that is already being figuratively run into the ground through a lack of competent planning.